Thank you Elizabeth, Robert, Cynthia and AshleyJillian for coming over to like my posting – it’s lovely to know someone reads your blog. Happy Easter to you all. Maggie. I loved your Easter poem (and the title is great.) One of the most interesting things about the poetry masterclass at the Writers and Readers festival was how they talked about the shape of a poem and the difference that line breaks could make – and where the spaces went, or how much space there was in the poem. Also relished your description of the Good Friday service – I’m sure a short story is waiting in there, esp with Father Bradford and the Waimea West girls. 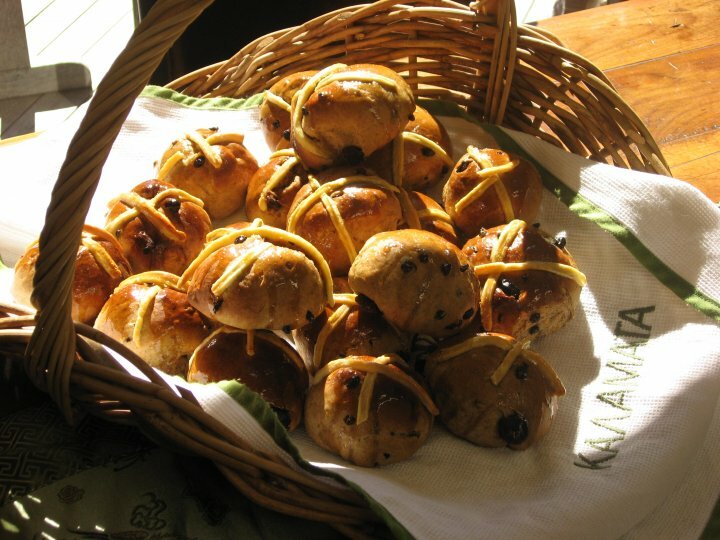 It’s lovely to hear about your family traditions too and the personalised hot cross buns (not to mention the mulled wine) – one of those things that your family will always remember and treasure, whether in NZ or overseas. Hello Pippa – thanks so much for dropping by to comment on my poem – it’s lovely to have the feedback. Yes, spaces and punctuation in poems – so much inferred from the comma or the line-break and I enjoyed working on-line with Mary when she shaped my poem into a cross, but then too, I liked reclaiming it as a run-on read – but I think it sort of works both ways. Yes, the hot-cross buns and the mulled wine go right back to our pre-children days when we had just come back from living in Europe (Norway for three winters and one summer) and the mulled wine recipe is from a Swedish Time-Life recipe book although it has been modified many times.